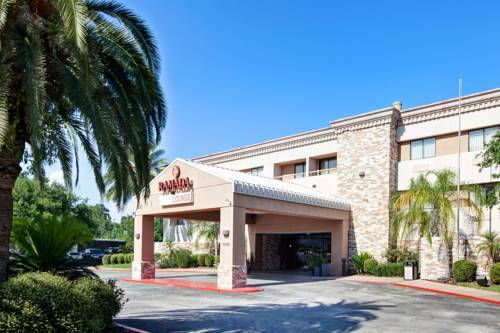 Refresh at this Ramada Houston Intercontinental Airport South hotel located just minutes from the Houston Intercontinental Airport near major business campuses including Haliburton. Also nearby are the Museum of Fine Arts, The Space Center Houston, golfing, and many local restaurants. After a day of business or leisure, relax at this hotel with complimentary wireless Internet access, complimentary breakfast, complimentary airport shuttle service, fitness center, outdoor pool, hot tub, onsite bar, meeting space and 24-hour business center. Hot tub suites, smoke-free and handicapped-accessible rooms are available. There is no charge for children 17 and under with an adult.